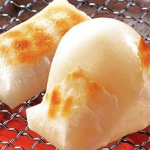 ‘Mochi-mochi’ is an onomatopoeia to describe the texture of mochi, rice cake. Cake here does not mean sweet baked food but a chunk. ‘Mochi hada’ means a smooth and supple skin, ideal for Japanese women. 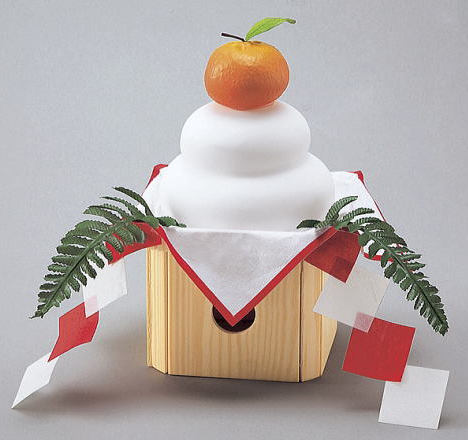 Mochi is a staple food to cerebrate new year and traditionally eaten from the first day of the year, often in soup. 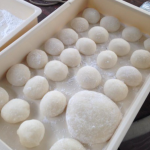 It is simply steamed rice pounded with water to make it slimy, and then rolled into balls and large discs which will be cut to cubes later when they are firm. 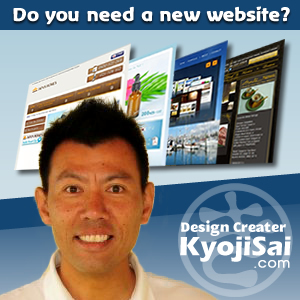 I remember my father and relatives pounding rice at the end of the year, though these days you just buy them. 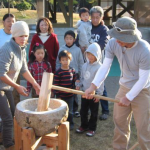 You have to use mochi-gome, sticky type of rice for pounding. 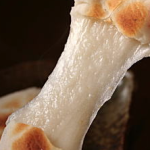 What you eat for meals is the other type called uruchi, which is less starchy. The other popular way to eat mochi is to grill it. Children have great fun seeing it expand like balloons. Once cooked, you eat it with a dash of soy sauce and sugar. In a modern twist, you can put a cheese stick and wrap it in nori seaweed sheet. 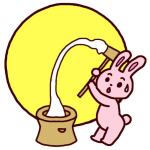 You have a man on the moon, we have a rabbit pounding rice on the moon. You see the long ears of a rabbit, the mortar and pestle (a large one, not like the one for grinding herbs).